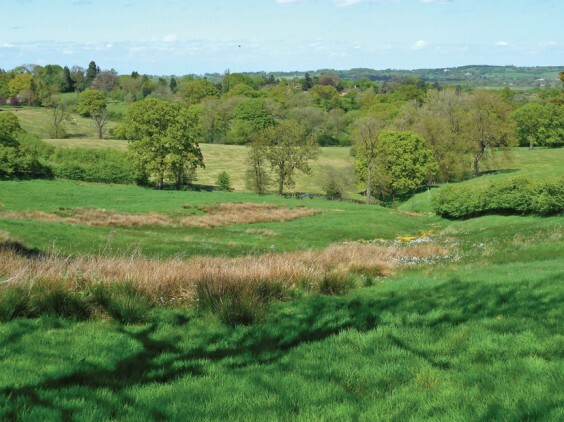 Mary Green takes a look at sites protected under the Wildlife Trust. I have never seen such a mild end to a year and start to the next. I walked through St Laurence churchyard in Alvechurch between Christmas and New Year and saw celandines in flower, and then a whole hedge of cherry-plum in blossom. Both of these usually flower in February if you are lucky – sometimes not till March. I don’t think the blossom will set fruit though, coming this early. The fields are still green rather than the ochre colour they usually go in January, and there is plenty for the sheep to graze on outside my window. Outside my door is a little wild strawberry flower (normally April) and broom is in bloom along the canal. The holly I brought into the house for Christmas burst into blossom, and the vegetable grower at the January farmers’ market has been eating her own asparagus. Last month I looked at regionally-recognised wildlife sites around the Village area. This time I am looking at Local Wildlife Sites, which have some protection and are recognised by the local Wildlife Trust. The biggest one here is the canal, as I mentioned last month. Another well known one is the Wiggin Meadows in Alvechurch. These meadows were given to the village for public recreational use, and to protect the environment. They include different habitats, and the Worcestershire Wildlife Trust advises on their management. The main open area should be meadowland, though a large piece of this has been mown and drained as sports pitches. However, there is still a large open space managed as a meadow and carrying a good variety of wild flowers. This is mown just once at the end of the year to mimic what happens in a hay meadow. Among the flowers here are meadowsweet, knapweed, sneezewort, lady’s smock, meadow buttercups, white and red clover, and yarrow. Like all traditional meadows, the ground is quite wet except in summer. Meadows are one of the old flood-prevention methods. The variety and density of the vegetation and its root systems means that the fields can absorb and hold water. If you compare a proper old meadow with a lawn or an intensively-farmed field, it doesn’t have surface water like them. Surface water runs off on to roads and into streams, causing flooding. It’s of course even worse on concrete or other hard surfaces. Re-establishment of diverse meadowland is one of the ways we can reduce flooding. It’s a myth that managing land for wildlife is not good for flood prevention: in fact land good for wildlife should be better for managing water flow too. In the Wiggin Meadows, outside this one meadow patch and the mown pitches are some areas not quite managed as meadows but not much mown, which are a bit like ordinary pasture land, carrying some flowers like buttercups and daisies. Then on the far left, if you have come into the main gates, there is an area of scrubland and then proper woodland. This runs back from where the snake sculpture is. Here there are lovely native bluebells in the spring, a sure sign of old woodland. Over the other side, on the right, is the river, with another area of old woodland. This has lots of wild garlic in the spring, and beautiful wood anemones. You generally find that bluebells and garlic, both of which grow in old native woodland, don’t grow in quite the same places. It’s very obvious in The Meadows, with one on each side! The crowning glory of The Meadows is its trees. There is the long avenue of horse chestnuts planted to make a way across the park (though sometimes a rather muddy one!) – these have gorgeous towering white flowers in May and later lots of conkers for the kids (or more often their parents!) to collect in September. There is the hedge of poplars at the far side. Several of these are black poplars (like the fallen one that made the sculpture), a native and now quite a rare tree. Others are the recognisable introduced Lombardy poplars with their tall pointed shape. All of these are popular parkland trees and mean there will be plenty of birds around. Older than these, though, are the oaks scattered around, which must have been here before the Wiggin family handed The Meadows over. The one over the far side by the poplars is very old, five or six hundred years. It has a huge, gnarled trunk close up, and was very beautiful, though it has been badly treated by recent cutting not following its growth pattern. I always think it looks like something out of Tolkien! There are other old oaks too scattered about the Meadows, and some fine old ash trees. There was an attempt to plant some new native trees a couple of years ago to replace some of the chestnuts lost to fungal disease. Unfortunately they were not looked after and didn’t survive. This shows that wild plants need proper management if they are to thrive. I’m afraid an awful lot of “Jubilee trees” across the country didn’t survive long, like many so-called Jubilee wildflower meadows. Because The Meadows is a public park, there have been a few non-native flowers planted, like garden daffodils and some Spanish bluebells, but most of the area is a good wildlife environment. I remember being grateful to it in 2001 when there was the foot-and-mouth epidemic and all the footpaths were closed. The only place you could walk and look at wildlife was in the Meadows. It is quite difficult for the parish council to manage it for sport, children’s play and wildlife, but the balance is generally good. The Meadows is a large area: some local wildlife sites are very small. There is a good example in a field just off Foxhill Lane, west of Alvechurch (pictured above). This is at first glance a rather unprepossessing-looking field, very wet with a stream rising in a bog in the middle of it. It is not on a public path. But from the nearby footpath you may spot the colours of wild flowers at some times of year, and in fact it is a haven of flowers that like wet ground. In particular, the boggy area is full of ragged robin in May and June. This is a now uncommon relative of the red campion and likes undisturbed wet fields. Its Latin name is flos-cuculi, the cuckoo flower, and its English name refers to Robin Goodfellow, the mischievous spirit of the countryside. It’s a very English flower. I’ve found it in a few other places round Alvechurch, but it has already disappeared from some of these. As well as ragged robin, this Foxhill field has other wetland plants like brooklime and marsh marigold. Its drier parts are full of betony. This is a pretty dark pink flower in the sage family, again quite uncommon now and a sign of undisturbed land. The other place locally you see it is in the Old Orchard at Barnt Green. The best thing is that this field used to be a haven of unusual wild flowers in a rather dull area of plain grass fields with the odd buttercups. Now the other fields around it are being managed for permanent meadowland, and wildflowers such as yellow rattle and orchids are coming back. So it’s no longer on its own, but now part of a new area of varied wild flowers. The whole of the hillside is now great for butterflies, especially on a hot summer day. The permanent meadowland is improving the drainage of this sloping land, along with some new ponds that have been created, so there should be less flooding on the lower slopes. Rowney Green has protected wildlife sites too. Some of these are fields to which the public doesn’t have access, where there are examples of flowers that like the slightly different soil found here. It was an area where sand and gravel overlaid the local clay, and the soil is slightly more acid. The one that some of us (the younger ones) get to visit, and that we all have access to once a year, is Peck Wood. This is owned by the Methodist Church and used as an outdoor centre for school children. Its entrance can be found just into Rowney Green Lane from The Holloway, but it spreads down The Holloway and above the bypass. It’s only open to the public once a year in April/May when the bluebells are out, but many people remember fondly going there as children. Some of Peck Wood is ancient woodland, and was part of the old Alvechurch Park, the hunting ground of the Bishops of Worcester. (The old fish ponds site in Alvechurch was also part of this, and is a local wildlife site too.) You can trace the raised bank which was the edge of this domain running up through the wood. Other parts are more recently planted, but are well-established woodland now. The important thing about the wood is that it is properly managed. This means that the trees are kept healthy and the understory never gets too thick, so there is enough light for the wood and its plants to flourish. It also means new trees are still being planted, in this case along the edge by The Holloway. It has all the iconic woodland flowers, though some people only notice the bluebells which make the valley solid blue and scented. These include the yellow archangel, a beautiful relative of the white deadnettle. It’s an old woodland marker which you also find traces of in local hedgerows and in one place along the canal towpath. There are wood anemones, delicate, whitish-pink and pretty with feathery leaves. Wood sorrel is also abundant, with its three-fold leaves (possibly the original shamrock) and white flowers. This winter I saw wood sorrel leaves in December, which is very unusual. Also in Peck Wood you can find moschatel. This is the “town hall clock” flower with its many faces, flowering around Easter. Again it is a marker of old woodland, and I have found some in a dingle near Withybed and along the canal near Tardebigge. There are some quite rare plants too in Peck Wood, like a special sort of horsetail and a wood sedge. As for the trees – they are all here! There are old oaks and beautiful beeches coming into leaf in spring, through which you will see wild cherry blossom and ash flowers, and all the smaller trees like hawthorn, holly and rowan. I suppose the thing that makes Peck Wood special is its shape, across a hillside with a valley down it, so there are always new views full of flowers as you walk through it. Peck Wood is full of birds of all kinds, which you can hear singing early and late on spring days. It also has a healthy population of badgers. These were moved when the new bypass was constructed on the edge of the wood but soon found where they want to live. The bypass was originally planned to cut through Peck Wood but a local campaign meant it was successfully rerouted around it. Woodland flowers are a spring phenomenon. Once the leaves are fully out on the trees they stop the sunlight coming in and the woodland floor goes quiet and green. That’s why Peck Wood is so good in spring. Later, you can transfer to The Meadows. Meadow flowers are best in the summer, out in the open. And of course our other local wildlife site, the canal, will have something in flower all the year round in its different habitats. So, you can see insects, like bees and butterflies, and birds all the year round through our area. In February, you will begin to see the new flowers and leaves of the spring, though you may have already seen them in January this year! Look out for dog’s mercury, another ancient woodland plant and one of the first to flower. Blackthorn and cherryplum should be out in the hedges if it stays mild. There may be wild garlic leaves coming up in The Meadows, though don’t pick them (or anything else) here in a public park. Look for them somewhere else, and you can have a true taste of spring in February. Last year we didn’t get any of this till March, and I suppose there’s still time for our weird weather to go cold again and stop them. I hope not. But I don’t think we will get the wonderful fruit crop this year like we did last year: fruit trees really liked that cold spring and wet summer, even if you didn’t! The poem is one of a series I am writing about day-to-day events this year. Strain to hear the proclaimed words. Booed to your heart’s content. Make him the Islamist threat. Though that’s what he was at first. The futility of the sword.